Kelly Marvin Barnett (CRD #4127608, Sarasota, Florida), who was a registered representative of MSI Financial Services from August 27, 2012 until being discharged on November 19, 2015, has consented to paying a $15,000.00 fine and being suspended by the Financial Industry Regulatory Authority (“FINRA”) from acting as a broker or associating with FINRA member broker-dealer firms until December 3, 2018 pursuant to a Letter of Acceptance, Waiver and Consent (“AWC”) #2015048320901 that was executed on May 11, 2018. Barnett was found liable by FINRA for discretionary trading in customer accounts without written authorization. As stated in the AWC, Barnett’s customer, JN, died of a heart attack on May 25, 2015. Apparently, on May 27, 2015, while not aware aware of JN’s death, Barnett placed three exchange traded fund (“ETF”) trades in the customer’s account. On May 29, 2016, Barnett effected the sale of JN’s ETF holding and purchased a unit investment trust (“UIT”). The AWC stated that JN did not provide Barnett with written authorization for her to trade in JN’s account using discretion. Also, MSI Financial Services did not agree to treat JN’s account as a discretionary trading account. It was also confirmed in the AWC that Barnett used discretion without written authorization in four more customer accounts between January 2014 and November 2015. MSI Financial Services, according to the findings, never accepted those accounts as discretionary either. Barnett evidently implemented an investment strategy without having spoken to the customers. Apparently, 25 discretionary trades were executed by Barnett in those investment accounts. FINRA Department of Enforcement found that Barnett committed a violation of NASD Conduct Rule 2510(b) and FINRA Rule 2010. The findings also confirmed that Barnett created documents which falsely indicated that Barnett spoke with JN on days that trades were entered to somehow convey that JN authorized Barnett’s trading. FINRA Department of Enforcement found that Barnett violated FINRA Rule 2010 in that regard. In addition, the AWC’s findings confirmed that from January 2013 to November 2015, Barnett obtained switch disclosure forms signed by customers despite those forms not having been completed by the customers. Apparently, Barnett submitted those forms in 19 instances to execute UIT exchanges. Because customers did not complete those forms, they neither reviewed details about which UIT had been sold or purchased, why the switch was being executed, or the charges for switching UITs. FINRA Department of Enforcement specified that Barnett’s completion of the forms falsely evidenced disclosures being acknowledged by customers, and caused MSI Financial Services to maintain erroneous books and records. 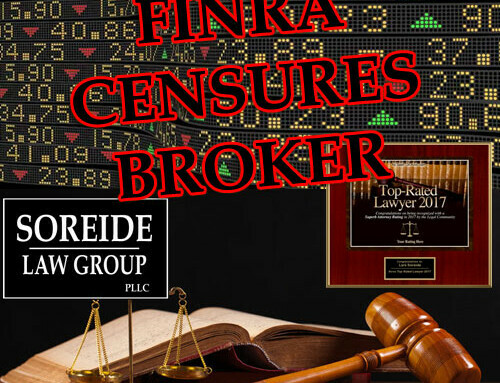 Therefore, FINRA Department of Enforcement stated that Barnett committed violations of FINRA Rules 4511 and 2010. If you have experienced losses from Kelly Marvin Barnett or another registered representative who traded in your account without your grant of written authorization, contact Soreide Law Group at (888) 760-6552 and speak with our qualified counsel about a possible recovery of your losses. Soreide Law Group is a Florida based stock loss recovery firm and only charges a fee upon the successful outcome of your case. Call for a free consultation with a securities lawyer today.